BEIJING - Local media is speculating that Dutch electronics giant Royal Philips Electronics is mulling whether to sell its LCD TV business in the Chinese market to Hong Kong-listed TPV Technology Limited. Philips spokesman Zhang Tonghua said the company "does not comment on speculation". 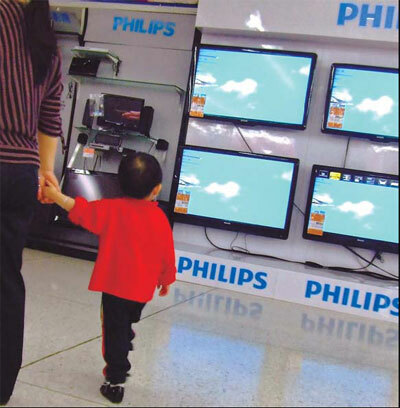 According to a report in Beijing Business Today on Tuesday citing unnamed sources from TPV, the two companies have already signed a letter of intent under which TPV will have the rights to use the Philips brand for its TV products as well as Philips's related patent rights, inventories, employees and customers. However, Analysts said the deal, if successful, could be a double-edged sword for TPV Technology. "Being one of the largest OEM (Original Equipment Manufacturing) manufacturers of LCD TVs, TPV Technology's own brand, AOC, has not performed well in the market," said Zhou Jin, an analyst at GF Securities. "TPV can take advantage of the Philips brand to drive growth of its own brand. It is similar to Lenovo's deal to take over IBM's PC business in 2004," he said. But TPV should also be cautious as Philips's LCD TV's market share in China is very small and the integration process would be very difficult, Zhou warned. Philips has a 2.58 percent share of the China's LCD TV market from January to May this year, ranking 10th in the market, according to figures from China Market Monitor Co, a Beijing-based market research company. "The reason behind Philips's poor performance in the LCD TV business is that the company integrated its worldwide business into three main sectors: healthcare, lighting and consumer electronics in 2008, and accordingly the company reduced its investment in LCD TVs' research and development as well as marketing," Zhou said. This is not the first time Philips has cooperated with TPV Technology. In September 2005, Philips sold part of its monitor and entry-level flat screen TV business to TPV.